← What are Transient Lunar Phenomena? Thales (639-546 B.C.) was born to a wealthy family in the ancient Greek city of Miletus, in a region which is now a part of modern Turkey. As a student he was sent to Egypt to study under the priests, who shared with him the closely guarded secret of the length of the year, the signs of the zodiac and the positions of the solstices. 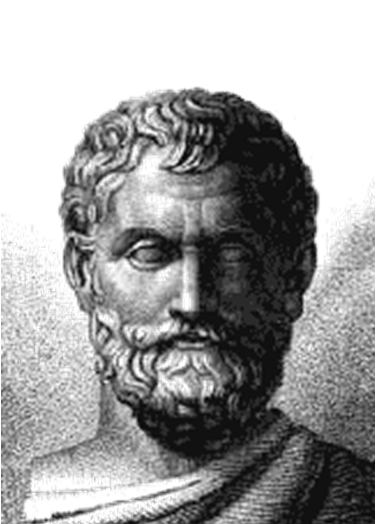 He is generally considered to be the first of the Greek philosophers, as he attempted to explain the natural world around him in terms of rational and understandable processes. For example, he wrote that the Earth floated in a vast ocean, and that earthquakes were caused when the world was buffeted by waves. Others of his time would simply have blamed it on the gods (perhaps they were at war again, or Zeus was stamping his feet in anger at something) and not tried to understand what was happening. His biggest claim to fame was predicting a Solar Eclipse, which was instrumental in stopping a war (The Medes and the Lydians had been warring for 5 years, when the eclipse happened as predicted. Both sides immediately stopped fighting and a truce was declared). He put forward the new ideas that the Sun, Moon, stars and planets were actual physical objects, and not merely marks on the sky. He also said that the Moon does not shine, but merely reflects the light of the Sun, and that this explains the phases. He explained lunar eclipses as happening when the Earth moved inbetween the Sun and Moon, and managed to measure the ratio of the Sun’s diameter to its orbit, accurate within half a degree. But he also got a few things wrong, notably that the Earth is a flat disk, and that it floats in a vast sea of water. Unfortunately, none of his writings (if indeed he wrote at all) have survived, so pretty much everything we know about Thales comes to us through the writings of Herodotus (in his History), and Aristotle (who considered him the founder of greek philosophy and mathematics).